Dan, 32, drinks 8 or 9 beers on a weeknight and 3-4 twelve packs between Friday and Sunday. He started drinking in college. The effects of underage drinking start to influence his adult life. However, he insists that he is not an alcoholic because he misses less than a day at work per year. He is also a good worker. But he has been arrested twice on DUI charge and frequently fights with his wife over his drinking habits. He admits that he had tried to quit alcohol before, but he cannot sleep without a drink or two and usually gets jumpy when he has not drunk for several days. 67-year-old Carla lives in a mixed housing project. Visitors have lately been complaining that they can smell alcohol in the room, but Carla does not appear to be intoxicated. They have also noticed that her health is failing rapidly, and she is not cleaning herself well. Often, she has vomit stains on her sleep wear. Her bedding too seemed to be soiled on occasions. Do you think Dan is an alcoholic? Should he seek treatment? Is Carla suffering from alcoholism? These are not questions for just Dan and Carla to figure out. When close to 90,000 people die every year in the U.S. due to alcohol-related causes, the onus is on all of us to lend a helping hand. Maybe Carla’s visitors could have taken her to an addiction counselor had they recognized the signs and symptoms of alcoholism. Maybe Dan could have taken an alcoholism self-assessment test if he knew about it. It is time to learn more about alcoholism stages and alcoholics. Read more to know how to prevent alcoholism. What is Alcoholism and Who is an Alcoholic? Alcoholism is the most severe form of alcohol abuse. This happens when a person becomes physically dependent on alcohol. What is social drinking and how does it differ from alcoholism? The user loses the ability to control or manage his drinking habits and will feel more compelled to drink to feel its euphoric effect and also to avoid the manifestation of withdrawal symptoms. There are many possible alcoholism causes, but the result is always the same. Contrary to popular opinion, alcoholism is NOT alcohol abuse even though they are both manifestations of problem drinking behavior. Abuse progresses to alcoholism when the person develops a physical dependence on alcohol. There are different types of alcoholics, but they all have something in common.T he person feels compelled to drink despite alcohol disrupting his or her normal, daily life. A tell-tale sign of physical dependence is the manifestation of withdrawal symptoms when the person tries to quit alcohol. Abuse can progress to alcoholism quickly without either the user or his or her loved ones realizing it. Does drinking alone make you an alcoholic? Alcoholism is a problem drinking behavior at its most severe form. When alcohol abuse turns into alcoholism, the person loses the ability to restrain his drinking behavior and becomes an alcoholic. An alcoholic is different from a social and a problem drinker. An alcoholic cannot cut down on drinking permanently. He may drink “less” or in a low-risk manner for some time, but eventually, he lapses into his old drinking habits. Beer alcoholism is one of the most dangerous types as it is much more tolerated in modern society. The other big issue is wine addiction – this drink is believed to be useful, and its consumption is culturally acceptable in most of the countries. However, those who want to get drunk will do it anyway with one of the alcohol substitute drugs – even if drinking mouthwash will be the only option available. The other dangerous alternative is making moonshine at home. The process is as dangerous as the consumption. The statistics on alcohol are disturbing. The incidences of binge drinking and heavy drinking, which are significant risk factors for developing alcoholism, are high in the U.S. Besides the number of alcohol-induced deaths, alcoholism-related diseases destroy hundreds and thousands of lives and careers every year. It has also been proved that an increase in the rate of alcoholism also raises the incidence of violence, especially when speaking about alcohol abuse in the military. Alcohol abuse is the fourth-leading cause of deaths (88,000 deaths every year) in the U.S.
Alcohol poisoning kills an average of 6 people every day. More than 16 million adults and about 679,000 adolescents suffer from Alcohol Use Disorder. 1 in 10 pregnant women drinks alcohol while 1 in 33 amongst these women binged on alcohol during the past month. Alcoholism in women is the only cause of Fetal Alcohol Syndrome that results in lifelong physical, mental, cognitive, emotional, and behavioral abnormalities in the child. Adult children of alcoholics also suffer from many social and psychological problems. 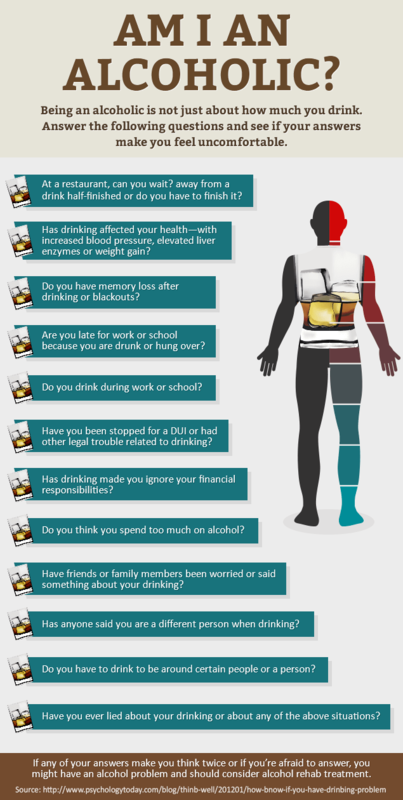 Alcoholism is very dangerous and life-threatening if not treated. Chronic alcoholics are at risk of damaging their brain cells and causing cognitive impairment, liver disease, and kidney failure. Although alcohol is not as powerful an intoxicant as other drugs, it can trigger fatal complications in the body when abused. Now here’s the irony. Alcohol by nature is not a very powerful drug. But if abused, as alcoholics do, it triggers a chain of physiological events that can turn fatal. In low doses, alcohol is a stimulant. Its stimulating effects manifest just after taking a drink or two when you feel all “loosened up” and relaxed. In high doses, alcohol has sedative properties. It depresses the functions of the CNS. CNS is that part of the nervous system that controls heart beat and respiration. In excessive doses, like the amounts people usually consume during binge drinking sessions, alcohol can slow down breathing so much that it may even stop. In increased doses, alcohol makes a person lose control over emotions and impulses and impairs the ability to think and reason. When drunk, people can indulge in violence and sexual activities that they later regret. That’s why using the spiked drink is one of the favorite choices of date rapists. Various drinks affect the emotions control differently. For example, isopropyl alcohol contains up to 90% of ethanol and will launch mental changes even if the relatively small amount of the substance was consumed. Chronic alcohol abuse damages the brain. It impairs the normal functioning of the brain cells, and in the long run, this causes neural damage. Alcohol can trigger fatal physiological symptoms even in low doses if it is consumed with other sedatives like heroin, prescription pain medicine, or sleeping pills. Even if the person consumes low-abv alcohol within safe limits, the combination of sedatives exerts a synergistic effect. Alcohol is toxic to the body. It damages the liver and the kidneys and can even cause these organs to fail. But make no mistake, alcohol can be dangerous in low doses as well. People have different levels of alcohol tolerance. This varies by age, gender, ethnicity, body type, and individual genetic makeup. The health of a person—the presence or absence of metabolic disorders, for instance—too determines how soon the alcohol effects start to manifest in an individual. Some people go red in their cheeks just after one drink; others are not tipsy even after several drinks. Because people have different tolerance levels to alcohol, the alcoholic may not always look or act like a “drunk.” He or she may not mumble incoherently or stagger down the streets. The person may also have full control of his or her senses. There are high-functioning alcoholics who hold responsible positions at the workplace and perform their duties satisfactorily and have families and hobbies. They can even cope with triggers of alcohol abuse in some cases. But alcohol catches up with them soon and wrecks their physical and mental health and destroys their ability to sustain healthy relationships. So how do you recognize an alcoholic? You HAVE to, to ensure that you can spot the early warning signs of alcoholism and get help for a loved one before it is too late. Read on to find out how to help an alcoholic family member. Exhibiting High Tolerance to Alcohol: A high tolerance to alcohol is a classic sign of alcoholism. The body of the person who has been drinking for a long time becomes used to having lots of alcohol in the system. It needs progressively higher amounts of alcohol to experience the “high” alcoholics crave. Showing Physical Signs of Alcohol Abuse: A flushed appearance, trembling hands, radical weight loss or gain, and the smell of alcohol in the breath are some physical signs of alcoholism. Subtle signs like neglect of personal hygiene in an otherwise well-groomed person can also indicate that he or she is focusing too much on alcohol or is too drunk to care. Exhibiting Psychological Dependence on Alcohol: If a person feels “compelled” to drink to relax, de-stress, or escape from problems, it is likely that he or she has become psychologically or emotionally dependent on alcohol. Some people believe that this can be treated like moderate drinking if the amount of the substance consumed is relatively small. However, the inability to cope with stress without alcohol is a clear sign of dependence. Drinking in Risky Situations: If a person drinks before driving or operating machinery, for example, pregaming before the club and still driving to it, it is evident that he or she is more concerned about alcohol than being safe. Displaying Withdrawal Symptoms: Mood swings in an otherwise calm and emotionally stable person, nausea or vomiting, sweating even if it is not hot, insomnia, lack of appetite, and headaches are some classic alcohol withdrawal symptoms. If a person displays one or more of these symptoms too often or usually in the morning (after not drinking through the night), be wary. The addicts may even try to find out how to get drunk without alcohol to reduce the unpleasant adverse reactions. Lying About Drinking Habits: Secretive behavior like lying about drinking habits or denying totally, hiding drinks, sneaking away to drink in the privacy of one’s room, and/or stealing money to buy drinks are warning signs that the person is aware that his or her drinking habits are abnormal. Neglecting Personal and Professional Duties: An alcoholic neglects his or her personal and/or professional responsibilities usually because he or she is too drunk to work or run errands, busy trying to procure alcohol or battling withdrawal symptoms. People living with an alcoholic are likely to notice the personal changes. Choosing Alcohol Over Relationships: Actions and behaviors like neglecting personal responsibilities, lying and stealing, getting involved in unlawful acts under the influence of alcohol (driving when drunk, violence, etc. ), or physically, mentally, or sexually abusing a loved one strain relationships. If a person continues to drink, it is evident that he or she prioritizes alcohol over relationships. But just as it is important to know how to recognize an alcoholic, it is equally important that you talk to the person about his or her condition. Convince him or her to seek help in one of the alcohol rehab centers. Alcoholism is a disorder that can be cured with specialized medical alcohol use disorder treatment, encouragement, love, and patience. Alcohol detox is the first step on the way to the lifestyle changes. Even the best books on alcoholism are unable to help without the professional assistance of the medical representative.